Reproduction of a Spong No. 2 Coffee Grinder or Mill This is a reproduction of a Spong coffee grinder or mill. I am guessing it was made around the 60's or 70's most likely in China. Spong & Co., was founded in England in 1856 and the style of their grinders stayed the same as long as they made them. This grinder was barely used if at all. All surface rust was wire brushed from the interior grinding mechanism and the outside was thoroughly cleaned. This weighs right around 5 1/2 pounds. This mill was most likely made right around the 1960's. 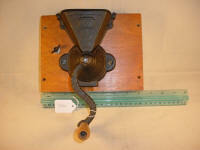 It was produced by the Wrightsville Hardware Co. which had purchased Logan and Strobridge in 1906. They continued to produce L&S mills under their name after they purchased the company. It was used very little and retains it's original label. This was stained at some time in it's life and was originally much lighter colored wood. It was cleaned inside and out. This is a Wrightsville Hardware side coffee mill that most likely dates to right around the 1960's. It has it's original finish and doesn't appear to have been used much if at all. The grind is adjusted with the wing nut which is attached to the back of the grinding cone. The interior grinding mechanism was wire brushed to remove some light surface rust and the exterior was cleaned so it's ready to be used. This is a copy of an older tin hopper wall mount coffee mill of the same name that was first produced by `Logan & Strobridge. The body is made of cast iron and the hopper is made of a sheet metal. It originally came with a red tin cup but this one came to me with the old tin cup shown which fits and works well and most likely dates to before the grinder (1960's). The hopper of this mill has some scratches in the paint and was originally red but the color has faded by being exposed to the sun over the years. It has been cleaned and is ready to be used. 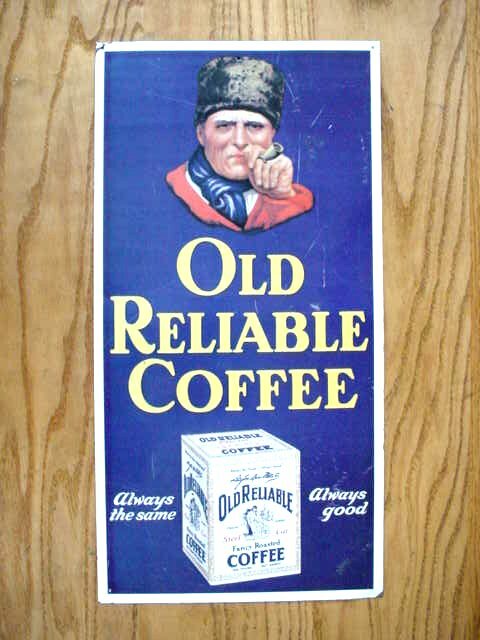 Reproduction Old Reliable Coffee Advertising Sign This is a new/unused metal reproduction of a 1930's Old Reliable Coffee advertising sign showing the trademark old man with his pipe along with a one pound bag of their coffee and the slogan "Always the same" "Always good". I was told these were made during the 1970's and are no longer being produced. 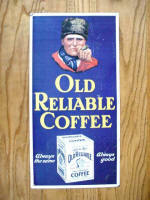 Original Old Reliable Coffee Advertising Sign These are new old stock advertising signs for Old Reliable Coffee. I purchased these from a man in Ohio who found these in a basement where his grandfather who had been a salesman for Old Reliable had left them many years ago. These are made of a heavy duty waxed cardboard material and look very nice framed. I have about 10 of these and the picture is representative of the bunch with some having minor rub-wear. 12 x 10"
I'll pick the best one out of the bunch until they're gone and send you a picture of it for your approval before mailing. An original 1902 booklet sold for 25¢ by Enterprise Mfg. Contains recipes and advertisements for Enterprise products. This one is marked on the back Selig Tan & Co. Tamaqua Pa". A very nice piece with some staining and bent edges. Has advertisements and prices for Enterprise products mixed in with the recipes. Basically the same booklet as above with different front and back covers. A nice piece with some light creases a corner missing on the front lower right . Stamped Compliments of Reber & Fisher Lewisburg, PA on the back cover. Has advertisements and prices for Enterprise products mixed in with the recipes. .
1898 Enterprising Housekeeper An original 1898 booklet sold for 50¢ by Enterprise Mfg. Contains recipes and advertisements for Enterprise products. It is lightly worn with some creases and foxing. It has a string through a hole that was poked in the top left corner making me think that this was hung up and used in a turn of the century kitchen. This one is marked on the back Compliments of J. A. Sullivan Hardware Northampton Mass. This is a scarce advertising booklet by OLD RELIABLE COFFEE from Dayton Spice Mills in DAYTON OH. A MOTHER GOOSE PRIMER, Every nursery rhyme has been changed to refer to the coffee. 1911, five by seven inches, in excellent shape -- only very minor wear. Missing label, could be Little Tot or other similarly sized mill. It has a crack in the grinds drawer but overall in good conditinon. This is a great little copy of an "Original-Patentado" Coffee mill which was made in the Basque area of Spain circa 1910 -1920. The wheel is marked Ted Arnold Ltd. The pencil goes in the side opposite the grinding wheel and you turn the wheel to sharpen the pencil with the shavings ending up in the drawer. It also has a small storage area under the lid. Works great and looks like it was barely used. It is shown with a full sized "Original-Patentado" in the last photo. Height 6" Wheel Diameter 4.5" Weight 2 lbs.